Hi, Bikes Can Work Family! I am excited to have found your blog through Dottie and Trisha’s bike blog. We, too, are a bakfiets-riding family with twins. 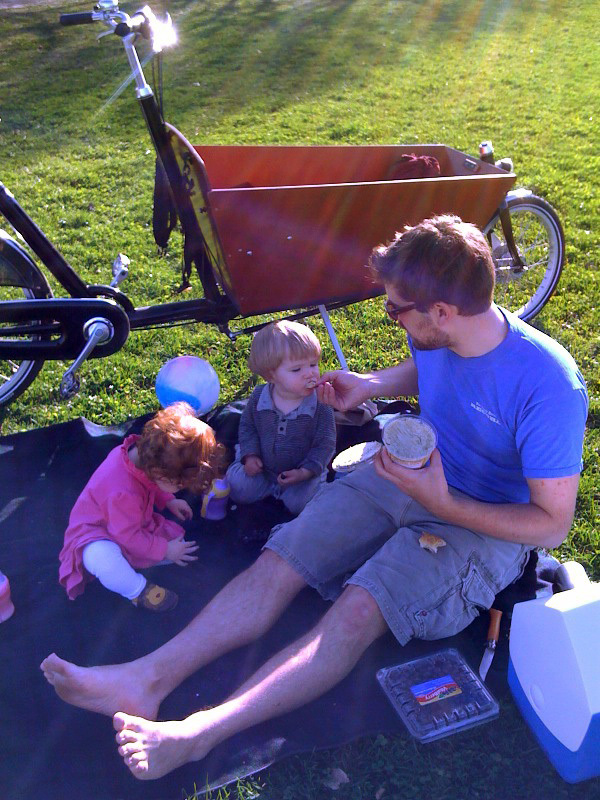 Our fellas are now 7 and we have a 4-year-old as well and our bakfiets continues to serve us amazingly well. We also own and ride an Xtracycle Radish. I will look forward to following along your family bikey adventures. p.s. You probably hear this a lot, too– “Boy, are your hands full!”– hence our blog name…. Glad to have you checking in! Last summer we came home from vacation missing our bikes terribly & thinking that we need to do just that– rent some sort of trailer or pick-up to bring our bikes with us next travels… Just found all your great photos on Flickr, too.